More than 250 readings are newly collected here to reinvigorate and update Unitarian Universalist worship. "As the generations rise and fall, the wars of the past are surpassed by the wars of the present age, prosperity and poverty diverge in new ways, and new technology remakes the world in ways Ralph Waldo Emerson, Ken Patton, Olympia Brown, or Francis Watkins Harper could hardly have comprehended. New words of love and truth, new memorable phrases, new encouragements are in order. Assumptions, sometimes unconsciously made in previous eras, have been challenged and rethought. Contemporary voices in this new century still revere both love and truth and find ways in worship of moving out of the familiar and into new territory. Styles of imagery and poetry that might have startled our ancestors encourage us to live out lives of depth." More than 250 readings are newly collected here to reinvigorate and update Unitarian Universalist worship. 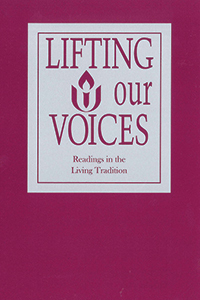 Just as Singing the Journey supplemented the hymns in Singing the Living Tradition with more diversity in perspectives and styles, Lifting Our Voices supplements the SLT readings with modern voices from an array of cultures and theological perspectives. Chosen with care by Revs. Mark Belletini, Kendyl Gibbons, Angela Herrera, Abhi Janamanchi, and Hope Johnson, these new readings, from Unitarian Universalists and acclaimed authors and poets are sure to become instant classics. and holiness holds forth in time. at dawn fast over the mountains split. is garnered from every thought, every heart that ever pounded the earth. . . .
will revise the pattern of the story, the song. until I am the sky, the earth, the song and the singer. because we are the only witnesses they have. the sea engulfs us and the light goes out. washed stone under a waterfall in the sun. In the end, of course, a true war story is never about war. and do things you are afraid to do. It’s about love and memory. It’s about people who never listen. and gives them new meanings.